While developers may not always be super concerned with SEO, their work plays a big part in a site's rankings. Read on to see how. In Part I of this series, we examined the impact that SEO has on web performance. In this article, we analyze the performance impact of SEO from the perspective of mobile sites. Back in November 2016, Google announced they were experimenting to make their index mobile-first. Google mentioned, "our ranking systems still typically look at the desktop version of a page's content to evaluate its relevance to the user. This can cause issues when the mobile page has less content than the desktop page because our algorithms are not evaluating the actual page that is seen by a mobile searcher." Google suggested the use of a responsive site or a dynamic serving site for a mobile-first transition. Some of the important aspects to consider while transitioning into a mobile-first strategy for your SEO are discussed below. The pitfalls of responsive web design and/or mobile site configurations are well documented. Broken web pages, pages that aren't optimized for mobile networks, duplicate content, troublesome transitions from larger displays to mobile screens, and device compatibility issues all lead to a poor end-user experience. Bad experiences lead to negative business outcomes such as higher bounce and abandonment rates. Hence, it is essential for any web developer to implement a comprehensive website monitoring strategy and test from a range of devices. Using real user measurements, you can identify the devices, browsers, and the frequency of occurrence to find out the core user group and optimize user-experience for these users and their devices. Once you've identified your target devices, you can continuously monitor your website's structure and its rendering on a wide range of devices using a combination of custom viewport settings and using the right user agent strings. As a crucial aspect in your mobile-first strategy, it becomes imperative to monitor your site performance from mobile networks (not just monitoring mobile pages on Wi-Fi). Optimize content to ensure there is minimal overhead on network usage as well as resource usage on portable devices. This includes optimizing images (compression based on user network), compressing text-based content, and various front-end optimization techniques (minification, whitespace removal). Accelerated Mobile Pages (AMP) is Google's open source initiative to make high-performing web pages (for mobile users). AMP pages are built using three core components, an AMP HTML, an AMP JS library for fast rendering and an AMP cache, for delivering all AMP documents cached. One of the biggest benefits of AMP is faster load times. AMP is known to have made mobile web pages load faster by three times. 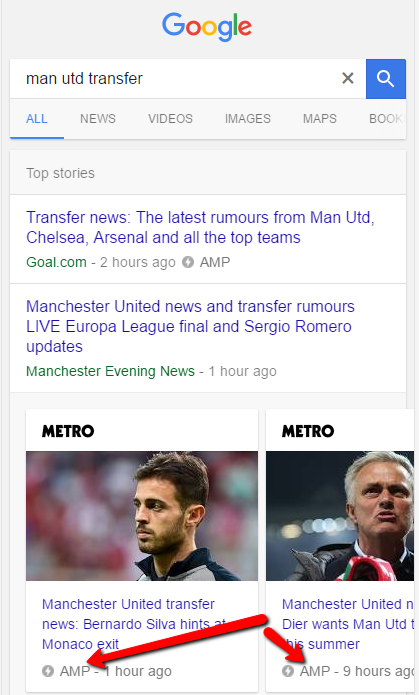 Google does not use AMP as one of the parameters for SEO rankings explicitly, but there is an AMP carousel that is above the fold, thus providing an incentive to implement AMP (not to mention the obvious benefits of having a very fast mobile website has a positive impact on overall SEO standings). Facebook's Instant Article (FIA) is an HTML5 document that loads very quickly in mobile Facebook. FIAs promise a ten times faster load times than standard mobile web articles, 70% less likely on article abandonment, and 20% more reads. To start publishing FIA, Facebook provides a checklist of best practices to follow. These include checking for broken/missing links, incomplete content, properly syntaxed RSS feeds, repeated media content, low-resolution media, and recommendations on style and content formatting. These recommendations force content publishers to uphold a high standard for their content and performance, thereby implicitly improving their SEO rankings as well. The end goal of both AMP and FIA is a faster loading mobile page. Implementing them requires time and effort to redesign, adhering to the guidelines, and due consideration to publishers' will. But what they do provide is a boost to your SEO strategy and website performance, and hence are worth investigating further. Published at DZone with permission of Anand Guruprasad , DZone MVB. See the original article here.